New England has unexpectedly become a hotbed of the new folk scene that has emerged in the past decade. At first glance it felt like it was just a perceived and inflated importance caused by the Newport Folk Fest favoring regional bands in their undercard selections. Perhaps that has had some influence. but at this point it does seem much bigger than just the work of one festival. One of the latest bands to emerge on the scene is Boston’s The Ballroom Thieves, with Martin Earley on guitar, Devin Mauch on percussion and Calin Peters on cello. They came to Rochester’s Abilene Bar and Lounge just ahead of the release of their debut full-length, A Wolf in the Doorway, out on April 21. As they took the stage the crowd was loud, chatty and hardly aware the band had begun. Opening with “Storms,” a pleasant plucked guitar with just Earley’s voice which could hardly pierce through the noisy din. But as Mauch and Peters’ vocals layered in beautifully, one by one the offending noises dropped out and the crowd nudged in closer. The vocals built to a climax with some punctuated stomping, and just like that the Thieves had stolen the bar for themselves. Right away Earley had proven he could carry a performance himself if need be, nailing his vocals and showcasing some quality guitar work. But this was a band of three. As they moved next into “Wild Woman,” a banging country rocker off their upcoming album, the other two were able to showcase more fully their contributions. Mauch’s set-up was customized and somewhat unusual. Just a tom, snare, cymbal and a djembe laid on the floor that acted as a de facto bass drum. Add to that a string of jingle bells that was wrapped around his thigh. Using sticks, brushes and various sized mallets, he was able to manufacture the perfect amount of noise to fit each tune. His resulting hypnotic seated dance was at times just as entertaining as the rhythms produced. So it begins with Earley’s guitar work. Then sprinkle on the unique rhythms from Mauch and engaging cello work from Peters. Layer upon that what might be this bands strongest attribute, their soaring 3-part harmonies. Working all together to perform the music they’ve written, a varied collection of rockers, ballads, hymnals, barroom blues and on, all hewing Americana. The new songs noticeably stood out as especially strong throughout the set. I expect A Wolf in the Doorway will be turning some heads in the coming weeks and months and year. It is such a treat to be able to see a young band’s evolution occurring in real-time on the stage. 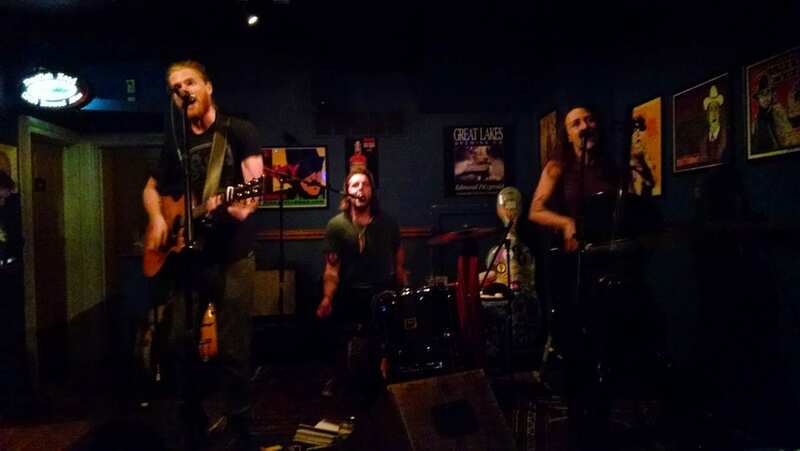 Usually you long for the days when you could still see a band with a small intimate crowd before they “made it.” But The Ballroom Thieves played beyond the walls of the small neighborhood bar. The sound reached up and out and yearned to be heard somewhere bigger, with better acoustics, more people, more energy, more everything. I’m looking forward to when they make it, which might not be too far off, and might even be up on that Newport stage.